Linda and I have been asked to speak at a weekend couples retreat at Muskoka Bible Centre on January 17-19. We are looking forward to it as we have a desire to see marriages strengthened and sweetened. 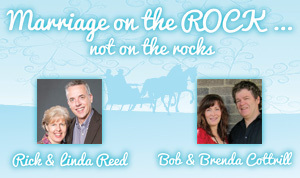 The theme for the weekend is Marriage on the Rock (not on the rocks). We’ll be talking about how to build our marriage on the rock-solid teaching of Scripture. Jesus said, “Everyone who hears these words of mine and puts them into practice is like a wise man who built his house on the rock. The rain came down, the streams rose, and the winds blew and beat against that house; yet it did not fall because it had its foundation on the rock” (Matthew 7:24-25). The good folks at MBC know how to make these weekends sparkle: hot chocolate by warm fires, horse-drawn sleigh rides through the snow, time to relax together as a couple. For details and registration information see the homepage on MBC’s website (muskokabiblecentre.com). Here’s an added bonus: MBC is offering a 25% discount to couples serving in full-time ministry. To top that off, Heritage has some additional scholarship funds available to our alumni who are serving in pastoral ministry. Contact kvalade@heritagecollege.net for details).